September is all about design in Brussels, with more than 100 cultural and commercial design events taking place across the city allowing interaction between designers, architects and the public in stores and pop-up stores, galleries and cultural spaces. "We are very proud because it will a huge amazing exhibition exploring different routes about what is happening in design today," says Roel Rijselbeek, director of Design September 2018, which will feature exhibitions, conferences, an arts and crafts itinerary, the Commerce Design Awards and the Brussels Design Market (BDM). "We will have design exhibitions in cultural institutions like Maison Horta, Bozar and Kanal - where there will be a huge exhibition about Belgian design. "There will also be conferences in Flagey with our guest of honour Georges Pelletier, plus a lot of art in design shops, art galleries and of course the 25 edition of the Brussels Design Market." Alongside Bozar, the Pool is Cool collective and landscaper Bas Smets will create a "closed ecosystem" of trees and a shadow pool, a place to relax amid greenery, open to all, with furniture by Piovenfabi and a bar. For its 25th edition, the BDM, the largest vintage furniture market in Europe, will offer an itinerary connecting the various vintage stores in Brussels. BDM organiser Julie Savie says: "We will be presenting an exhibition of Italian design of the 60s, 70s and 80s which will focus on radical design, by highlighting Archizoom, Super Studio, Memphis and designers like Etorre Sottsass." New this year is an Eco Design itinerary which will show the innovation that local designers have put into research and applications to create the most ecological solutions for retailers. 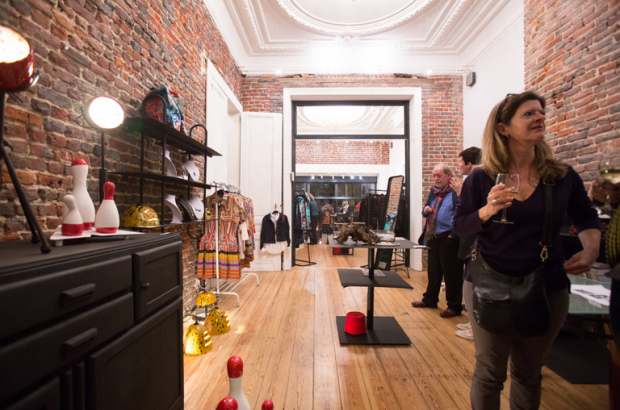 Julie Bonnichaux of Up Brussels is organising "a small fair at the inauguration at MAD Brussels in order to show retailers how they can apply eco-design to their shops". She adds: "Then we will organise three weeks of retail tours and publish a best practices guide for retailers." The arts and crafts itinerary will focus on textile design. Various textile workshops and studios will be featured and there will be a collective exhibition at the BIP.